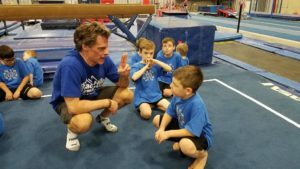 Our Girls Team Prep focuses on perfecting the poses, routines, and skills your daughter will need for long-term success in gymnastics! The primary aim is to get ANY girl ready to win big later in their career. Our Boys Team Prep gives our coaches a chance to see what areas need improvement. At this stage, boys are still filled with their usual youthful energy. Our coaches channel that and turn them into top performers!